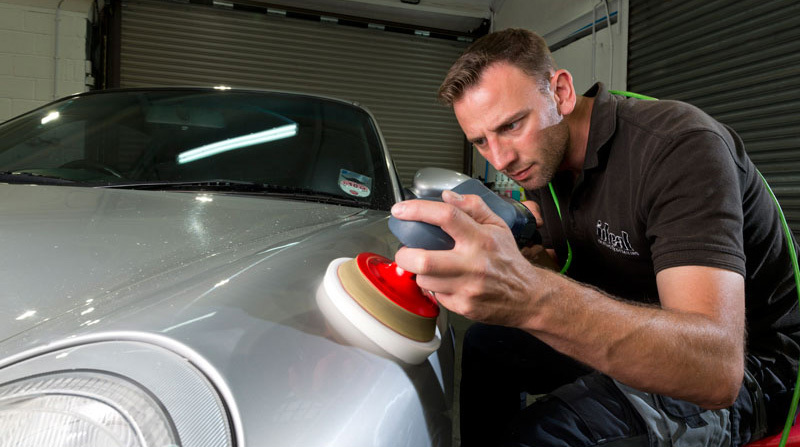 Founder of the business, David Whitehouse, set up Ideal Valeting & Detailing back in 2007 to provide an unrivalled, first class service for clients like you. Clients that are looking for a service over and above your usual car care company. Back in the late nineties, early noughties he quickly realised while working for various main dealerships that he must have been doing something right when sales executives were constantly asking if he could make sure that their car was prepared by him. It was abundantly clear that his attention to detail and desire to make a car look drop dead gorgeous was soon going to turn into more than just a 9 to 5 job and a few years later Ideal Valeting & Detailing was born. Fast forward to the present day and with the continued support of many valuable clients, the company has gone from strength to strength and now trades almost entirely from referrals and recommendations, the best form of advertising. With many things in life, experience is key and with over 15 years in the trade, David certainly has this basis well and truly covered. As mentioned above David worked his way up from mainstream dealerships picking up great advice along the way but also seeing first hand how certain processes should not be carried out. Cutting corners is not something that comes naturally. Throughout the years of working in the motor trade he was given a few different opportunities to work in different sectors. Sales, parts, mechanicals etc, again taking experience from each and every one and while enjoyable the need to create that incredible look that only a freshly detailed car can give, was always going to take first place. It is this broad range of invaluable experience, that gives you, the customer peace of mind that your treasured sports, performance or super car is in the safest possible hands. Ideal Valeting & Detailing is approved by www.pro-valets.co.uk The largest trade association in the UK. Members nationwide are strictly checked for a proven track record in business, valid insurance and quality of workmanship. Fully insured means just that, whether your car is being worked on at home or work or you’ve left it with us in the secure workshop over night, every aspect of the process is completely covered with a comprehensive motor trade policy. Our mission is simple, “that’ll do” simply isn’t good enough. If something’s worth doing it’s worth doing properly. Going the extra mile and NO compromise. (you get where we’re going with this) Constantly striving to have a 100% success rate in terms of customer satisfaction but most importantly giving you the customer, a car that looks so good you’ll be the envy of all your friends, work colleges and neighbours. David’s work speaks for itself! The time and care he takes over each vehicle is simply breathtaking and the results never fail to surpass your expectations. Just wanted to thank you for the work you completed on my S2000 recently. I must say that the work you did was fantastic and it was everything that I wanted and expected. It was great to meet someone who was passionate about his job and I felt confident my car was in good hands. The work that David undertook to restore my Porsche was nothing short of incredible. His company set up, professionalism and attention to detail delivered results way beyond my expectation. Every single area of the car was given such a high level of attention including the exhaust, glove boxes, engine compartment, door hinges, all glasswork and I am still noticing new areas that he had cleaned. I asked David from Ideal Valeting to do some work on my Velvet Blue E46 M3 to remove the usual swirl marks that could be easily seen all over and to bring the car’s paintwork back to life, 2 days of hard work later and the car looks brand new again! David is a perfectionist and I would be happy to recommend him (already have actually) to anyone thinking of giving their car’s paintwork a new lease of life. Top Marks from me!! Judging by testimonials already left, there’s little more I can add that hasn’t been mentioned. However, if you’re reading this to make up your mind as to whether or not you will use this company, stop wasting your time reading anymore, & give them a call – I’d stick my neck on the line, to go as far to say I guarantee you will not regret using them – absolutely 100% care, attention to detail & professionalism….we use them on a regular basis, & I can categorically say you will not find a better service!